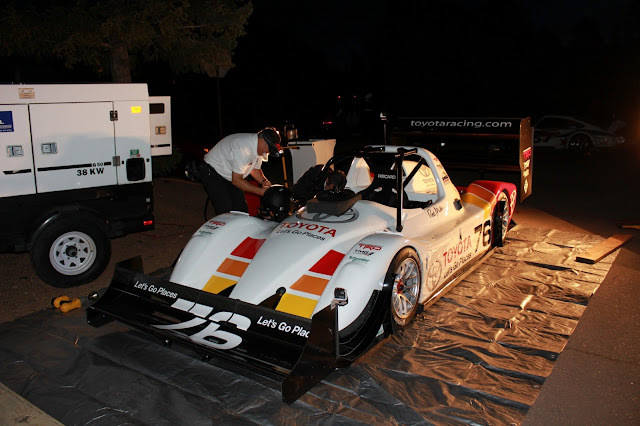 The TMG EV P002 race car is ready to defend its electric record at the Pikes Peak International Hill Climb (30 June) after concluding a successful upgrade and testing programme. A two-day testing session at Pikes Peak was completed smoothly at the weekend, delivering encouraging results to the team from TOYOTA Motorsport GmbH (TMG) and TOYOTA Racing Development USA (TRD USA). The test session saw the TMG EV P002 run on half of the track each day, with combined times indicating a time significantly quicker than last year’s record. Multiple Pikes Peak record-setter Rod Millen was at the wheel as fine-tuning was carried out on the balance, braking, traction control and cooling, while tyre choice was also evaluated. Based on data gained from last year’s record run of 10mins 15.380secs, engineers at TMG’s electric vehicle technology centre in Cologne, Germany have made enhancements to the electric powertrain. Motor speed and torque have been increased while the powertrain’s operating parameters have been tuned to better suit the challenge of the unique 19.99km (12.42miles) Pikes Peak track. It now delivers 400kW of power and 1200Nm of torque. Since arriving in the United States last month, engineers at TRD USA have performed aerodynamic and other upgrades to the chassis. With a three-fold increase in downforce and new carbon ceramic braking system, combined with the electric powertrain upgrades, the TMG EV P002 is now ready to take on the challenge of an increasingly-competitive electric class. TMG is using its pioneering off-board battery-to-battery charging technology, including Schneider Electric EVlink™ DC Charger, to charge the TMG EV P002 from the mountainside, where there is no reliable connection to the power grid. Mounted in a TOYOTA Hiace, the TMG DC Quick Charger includes a 42kWh lithium ion battery, which charges directly from the AC power grid. After an overnight charge, it quickly delivers high levels of power to the TMG EV P002 without additional installation or infrastructure. With varying current and voltage output, the TMG DC Quick Charger is an independent source of power for rapid recharging in any location and it is being used to charge the TMG EV P002 throughout the Pikes Peak event.